5 bags of the Montana sapphire gravel from the El Dorado Bar, Missouri River, Helena, MT. 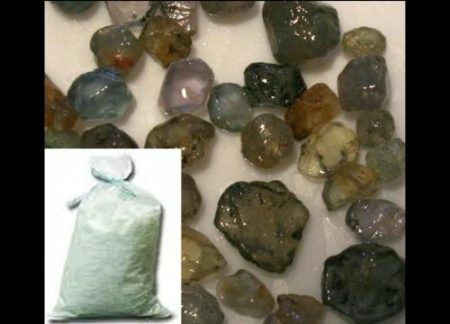 Each bag contains 2 gallons of natural, unwashed, concentrated Montana sapphire gravel from a private claim on the El Dorado bar. The natural gravel may also contain rubies, garnets, hematite and/or gold. The sapphires found in this area generally range from 1 to 6 carats, but an occasional stone around 20 carats is found. If you like rock-hounding, this deal is for you. Sorry, no guarantees.